Earlier today press review embargoes were lifted for Samsung’s latest Galaxy S9 and S9+, which reviewers cited was an iterative update compared to its predecessor and not enough to take down Apple’s iPhone X. 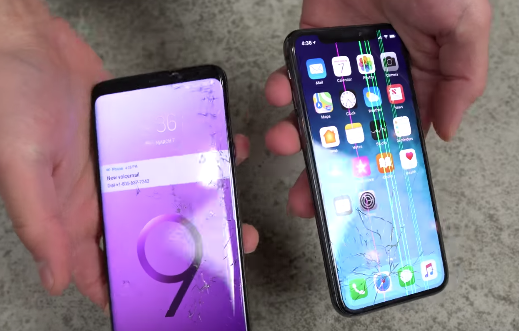 If you want to watch an unscientific drop test, YouTube channel EverythingApplePro drops the Samsung Galaxy S9+ and iPhone X in his garage, to see which phone would survive the longest. At the end of the day, the iPhone X outlasted the Galaxy S9+, which was attributed to the former’s its stainless steel frame, which was called “absolutely flawless” after “a tonne of abuse.” Despite taking on a tonne of damage both front to back, the iPhone X took four drops from 10 feet for its display to fully destroyed, but even then parts of the screen still worked. I used to use my iPhones ‘naked’ but ever since the prices have kept creeping up over the years, I’ve succumbed to cases. Currently, I’m using Spigen’s Ultra Hybrid for iPhone X, which I bought on Amazon.ca.